Early Sunday morning, Baby G woke up to request for his milk. Actually, it's not request, but shouting from his room "Mummy, I want to drink milk milk". If I do not answer him, he'll continue to shout until I respond. 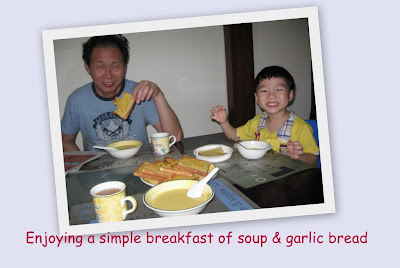 Since I was already up, I decided to make a simple breakfast of soup & garlic bread; actually, the main reason was that I had 2 jars of chopped garlic that would go to waste if I didn't use them. After our breakfast, the boys lazed around the house while I did my chores. Lunch was a simple pasta dish. Baby G only ate at about 2pm, after he woke up from his nap. Before going over to Ah Ma's place, we went to Compasspoint to run some errands. (1) Return my library books. (2) Go to Singtel shop to settle some billing inaccuracies. (3) Pop over to OCBC to check out their latest promotions. 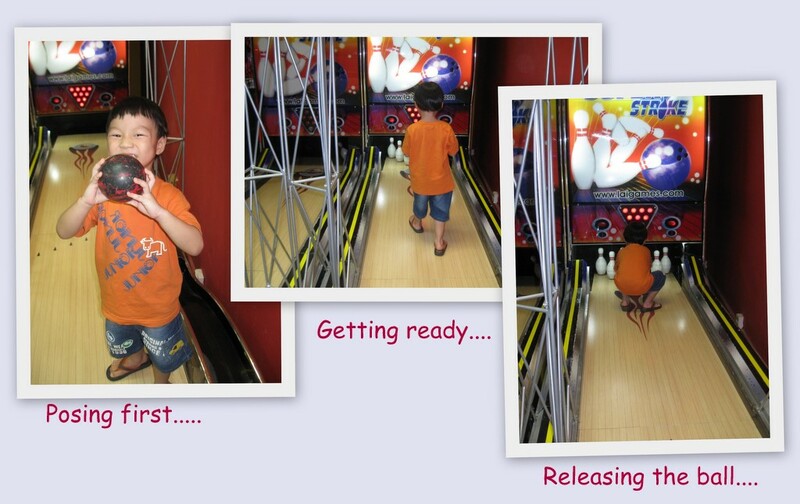 As the queue to Singtel was super duper long, we went over to Timezone for some noisy fun. The computerized bowling game that Baby G used to play was out of order, so we let him play the more traditional bowling game. He started out standing a distance from the pins & releasing the ball, but later he realised he wasn't really getting a good score, so he walked closer and closer to the pins before releasing. But I think he was too close and ended up with an even lousier scoreline. In the end, he won 4 tickets, I didn't really notice the actual score though.